This post is sponsored by Talbots and ShopStyle. I was also provided a gift card to choose what I wanted to feature in this post. Remember how I said in this post that we should be watching Talbots’ RSVP line carefully in the next few weeks? 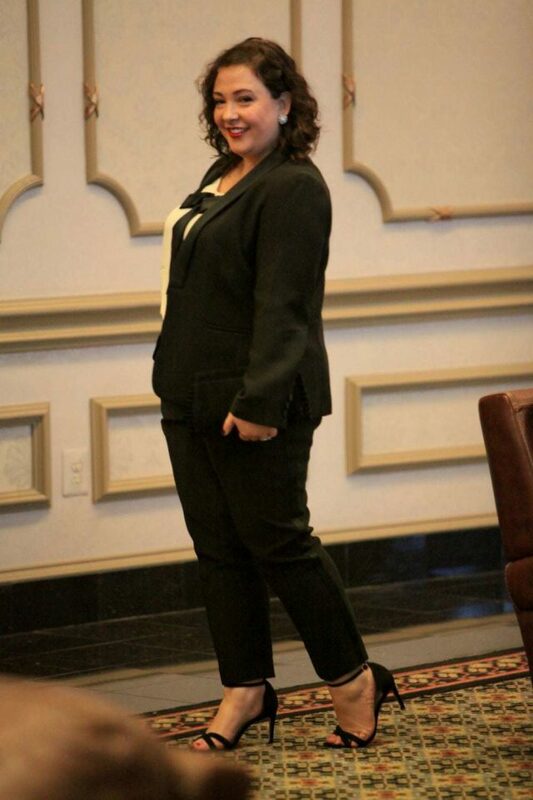 That watching paid off with this lady tux (link to the jacket, link to the pants) which I scored during Talbots’ Friends and Family event (sign up for Talbots’ emails it’s a great way to know about their sales and new arrivals). I’ve wanted a tux for a while, and have written about the appeal of one on many occasions. Thing is, tuxes at most retailers aren’t cut in a way that flatters petite curves. A trim leg gives a more current feel than a palazzo pant. I just bought this and haven’t had time to get it tailored but this is worth getting tailored. The quality is really nice. Pants like these often stretch out on me and I get all, in the words of Zac Posen, “poopy pants” and that is not cute. I got these and the waist fit great but the calves were a tad snug on my 20-inchers. I wore them for a couple hours the other day to try to stretch out the calves but they didn’t… and they didn’t too much anywhere. They also didn’t stretch out after wearing them for this shoot. Fully lined, quality construction, luxe fabric, this is a really lovely suit. I’ve had the shoes for a while, it’s hard to see that they're suede from far away, which I like. But I decided for this look to highlight it by adding Talbots’ Ruffle Suede Clutch (BTW it also comes in the prettiest shade of pink). Talbots always has great occasion shoes, but unfortunately were sold out in the styles I liked in my size when I placed my order. 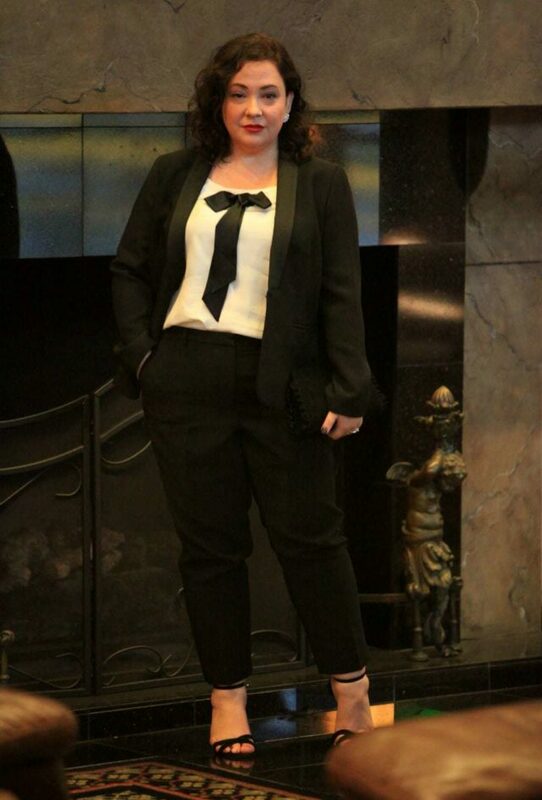 This tux could work with heels of any height or a flat. I recommend the more statement your jewelry makes fthe more subtle your shoes and vice versa. If you require a certain shoe for your feet, this tux would likely work with it. Sure it’s a pantsuit, but it’s refined and feminine which means it can look pretty right with a broad range of shoe styles. Play up the masculine with lace-up shoes, and balance it with a more feminine blouse or sparkly earrings, maybe even pin a faux flower in your hair. 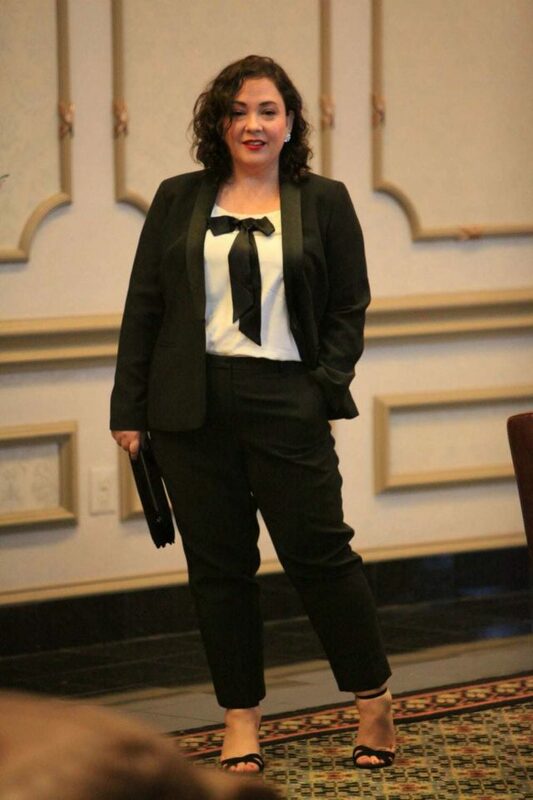 I bought the tux online and thought this blouse would be a fun pairing, giving a bit of a… Charlie Chaplin/Diane Keaton touch to it, the bow picking up the satiny lapels and stripes down the sides of the pants. It has an unusual neckline but still covers my bra straps so I could take off the jacket if I got warm on the dance floor. It’s really lovely, and it’s decadent like a massage or facial to wear a silk charmeuse blouse. I ordered the wrong size and went to Talbots to exchange the blouse and saw a few other blouses that could work as well (not currently online but as I said, keep watching Talbots’ RSVP Collection for new arrivals). Looking for a warm cocktail look? Add a cashmere turtleneck and balance it with some sparkly flats and a glam manicure. Want a classic look? 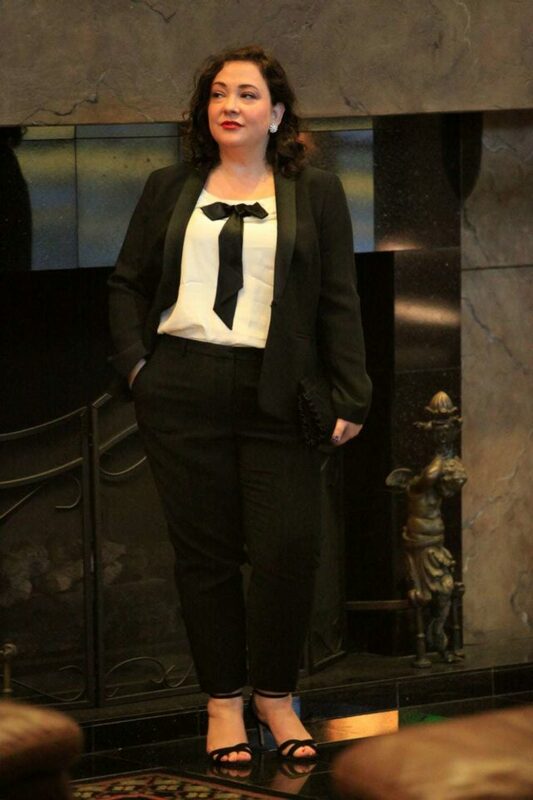 A traditional tux shirt or blouse, if well fitting, would look very chic. 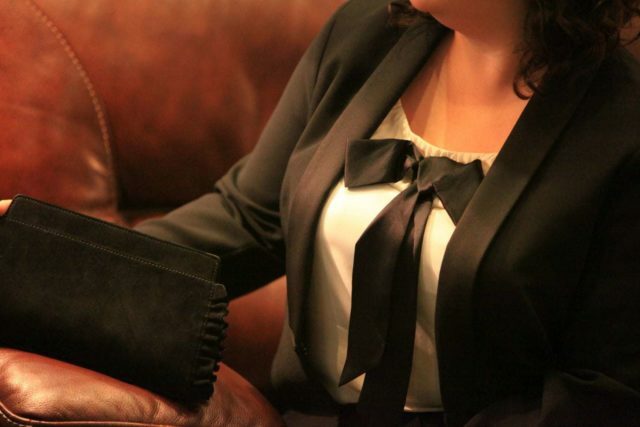 You can also do a simple silk charmeuse or crepe camisole in black, allowing the shape and detail of the tux jacket to shine. I really like these earrings, they add just a bit of sparkle without being too much. Even though I knew I wouldn’t wear it with this outfit I also ordered the brooch that matches these earrings. The brooch is so glorious, sparkly and fun-yet tasteful and classic. It makes me want to wear it with a sweater like the Sabrina Pullover and have hair like a character on Riverdale. Such a brooch would also be a nice way to glam up a clutch purse, and I love the subtle matching that only a few would notice. Expect to see me wear the brooch soon on a coat, blazer, or heavyweight sweater. A few of you have asked recently how I know something is worth paying for a tailor. These are the kind of pieces that deserve it. 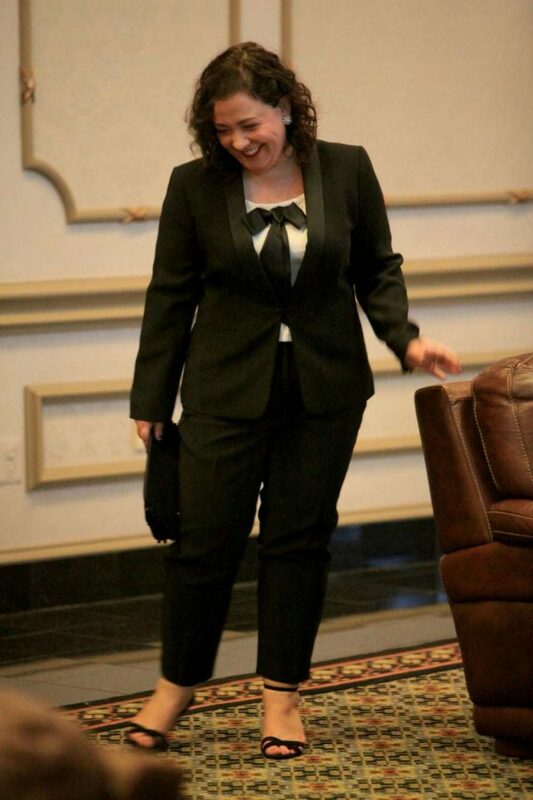 A lady tux like this is a modern classic. It’s something you can have in the back of your closet and pull out for those various events on your calendar. That fundraiser, that evening wedding, that wedding with your college friends who didn’t have kids, do have Tesla, and an impressive collection of vinyl. Once tailored, you will look hot as heck on your good days, and even on your bad days you won’t look desperate or clueless or like you gave up. Having those suits of armor is worth more than a bunch of quick fix pieces that only see the light of day that one time. I will be getting this tux tailored. Over time I’ll add a couple more blouses that work with it to switch up the look, and a pair of shoes that flatter it. It’s an investment look and I know it will be perfect for the holiday season. Just stopping by to say I scored the blouse about 60% off (did I calculate that right?) recently. I’ve learned my lesson – never pay full price for Talbot stuff. I love almost everything they put out but I feel it is way overpriced. Got a couple dresses on sale too – also marked WAY down. Checking – Blouse originally $99; I got it for $30, I think. Today it’s $27.99 – rats! Can you remove the bow without damaging the blouse? It would be nice if you had the choice of with or without. No it’s firmly attached and the straps of the shell are the same black silk. This suit looks awesome on you. If we talk about the black color then this color is always awesome and look classy especially in professional dresses. Hey Allie,You are most welcome. Just want to know that do you accept guest post? Hey Allie, your most welcome. Just want to know that do you accept guest post? No, if you check my about pages it’s pretty clear. Also I have been contacted by a Jennifer also by Cosabella wanting to add links to my site without paying and wanting to do a guest post without payment. Not cool. Very elegant! You look beautiful. I would like this outfit even more without the black bow. Wear a colorful men’s bow tie, untied, instead of the bow. Or a too-long necklace. 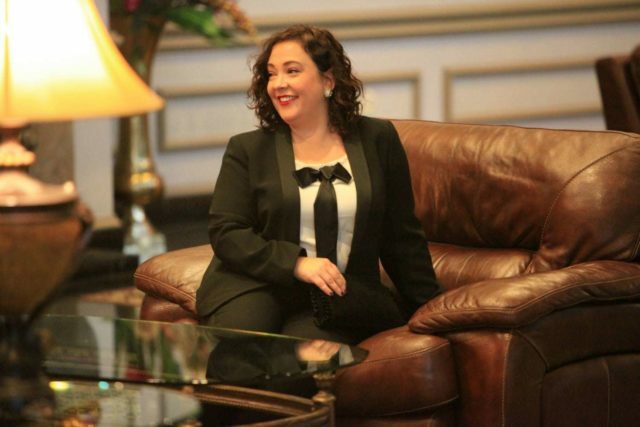 The bow isn’t usually my look, but going through Talbots’ collection I felt the blouse worked well with the suit. But I love your ideas on how to style this tux in the future! This looks great on you. I had a tux jacket back in the day and you’re right, paired it with red or green satin shells/tanks and it got me through many a holiday occasion. I took a peep at the brooch too, what a statement piece! That will look beautiful on anything. Thanks Michelle! And yes that brooch is one I think will get a lot of use over the years! Love the look. Is it smarter to buy a size up if you’re having it altered? Yes always size up so you have the right fit where you need it (shoulders, bust) and then a tailor can nip where needed. This looks terrific on you! I love the look Alison! That tux already looks amazing on you! What a classic, bold but totally correct look. What alterations are you planning to have done? 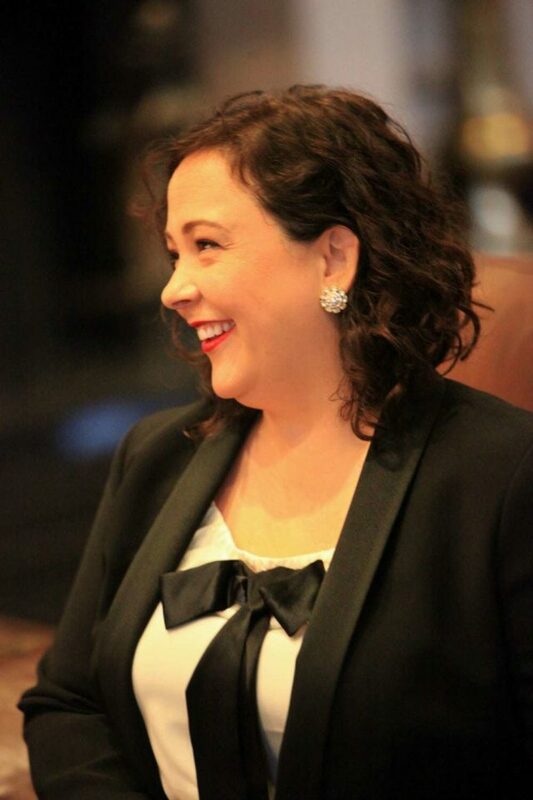 Looks fabulous on you, Alison! You look amazing in this outfit. I will be watching for these pieces in the red tag sale. Thanks Pat! And watch for their sales I got this during their Friends and Family!